Start in Athol, MA on RT2 West. Take the RT202 South Exit, and follow it right down to RT9, outside of Belchertown. There's a few scenic pull-off along this stretch. Unfortunately, they aren't well marked, and they are mostly gravel. Take RT 9 East. At this point, there will be a series of roads that lead to the Windsor Dam, and other scenic spots. This is a good place to stretch your legs. Just past Ware, MA, take RT32 North. In Gilbertville, switch to Rt32A north, and ride that up to Petersham. There's a country store there that sells great sandwiches. Hop on 32 north, briefly, then take a right onto RT101, and ride that up to RT2 in Templeton and this ride's end point. The Quabbin Reservoir is HUGE. By looping around it, you get a sampling of forests, views, farmland, and sleepy little towns..
Around the Quabbin, it's terrific. If you go to the scenic sites along the south edge, you get to ride right close to the lake. Some pretty long stretches on the west side with nothing but woods. Keep an eye on your gas level. on August 17, 2009 2 out of 2 members found this review useful. As a resident of central MA I have taken a very similar route, the only difference is that I will follow route 9 west to 202 north then take 122 south back through Barre and then take route 67 back to route 9. All in all it really is a nice ride. especially in the fall. on October 29, 2012 1 out of 1 members found this review useful. Coming in from Rte 2 in the Albany area heading back home to Cape Cod. Had time, so did the full loop then realized I've been on rte 202 before. 3rd week of October, mid week and very little traffic. Really enjoyed the ride, nice and easy, beautifull area. We live in the area, and have travled all around the Quabbin, as what another poster stated you have to check out the reservoir and all it's history. Good Ride - I would also suggest a visit into the reservoir area as the views inside are great. An entrance to the reservoir can be found off of Rt. 9. - Steven G.
on May 31, 2009 1 out of 1 members found this review useful. Relaxing and gentle curves with beautiful scenery. on July 30, 2017 0 out of 0 members found this review useful. This ride is awesome. 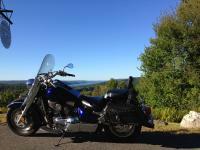 Take a detour into the 2nd entrance of the quabbin on the south side and enjoy the view from the Enfield Overlook. Rte 32 on the east side of the reservoir is a blast! All good roads (except a section after you turn off 32) and a nice mix of speeds and road types. Great views, fresh air, no traffic. on August 27, 2015 0 out of 0 members found this review useful. Awesome ride I did it in the reverse direction. There was a lot of new road surfaces except for the middle of 101 32 and 32A were awesome nearly deserted. The quabbin entrance I went in brought me up to the Enfield lookout I could hear the loons down on the reservoir. Rt 202 was nice a little twisty and good speeds if you have the need for speed. on September 4, 2013 0 out of 0 members found this review useful. Real nice ride .roads are good scenery is excellent.well worth the time. I will be doing it again to check out more of the reservoir. on August 2, 2010 0 out of 0 members found this review useful. great ride I nclude this area into my week-end trips 2-3 times a year.